Selmani’s image is related to an old Albanian quote: “You can’t hold two watermelons in one hand”. The proverb refers to the inability to gain two things at the same time, which also implies being here and there simultaneously. Moreover, the quote sums up most of the artist’s biography via his nationality identity. Selmani was born in the Former Yugoslav province of Kosovo as an ethnic Albanian, but the country broke up into several new countries as a result of the war in 1999. Kosovo, after being supervised by UN, declared independence in 2008 as a result of a new framework supported and reinforced by the majority of western countries. An important aspect in the political process of transition is that Kosovo institutions have been encouraged by the international community to work on branding: especially “Kosovars – Kosovans” as a new national identity. This represents a political and conceptual strategy to mitigate possible tensions between Albanians and Serbs. Artists like Selmani are torn between a political era that does not seem to take them very far; they seem neither able to delve into the past (in terms of nostalgia for past years, traditions and beliefs), but neither can they clearly look to the future. 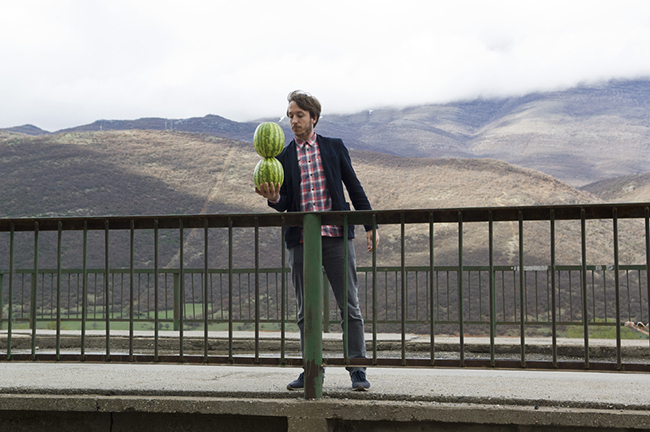 The image They say You can’t hold two Watermelons in one Hand was shot between the Albania-Kosovo border, on a bridge that separates the two countries in a sort of no man’s land. The artist is thus portrayed in the attempt to hold the fruits and unstably maintain his balance.